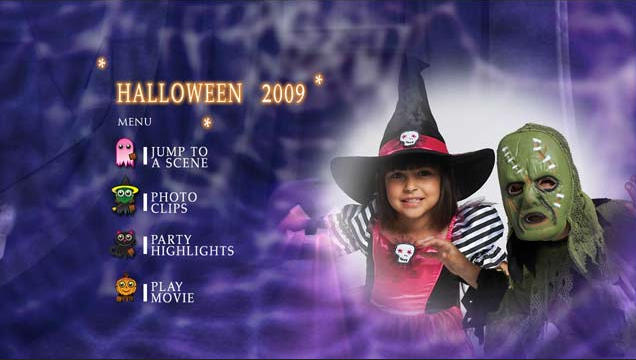 Introducing our new DVD Package for Halloween – with a motion menu. Resolution is the measurement of how many dots/pixels fit into one inch. The higher resolution, the sharper the image will be. Low resolution images print fuzzy, jagged and blurry. Printer’s resolutions are expressed in dpi, dots per inch. DPI is a measure of printer’s quality. In general, the more dpi, the smoother is the tonal gradation in the print, the finer the definition and the wider the color gamut. Digital image from a scanner is expressed in ppi or pixels per inch. The multiplication of the 2D pixel dimension of an image amounts to the Megapixels values of the image. An image of 640×480 is 0.3 Megapixels. Minimum resolution for magazine-quality printing is 300ppi, so an image of 1200×900 will only allow for a decent print of 4 x 3 inches (1200pixels/300ppi=4 inches by 900pixels/300ppi=3 inches). 1200×900=0.96Mpixels. If you want a decent 8×10 print, you will need the image of 2400×3000 (~7Megpixels). Images should be 300 dpi (dots per inch) at the final print size. Images which include text should be 400 dpi at the print final size. Computer monitors generally have a display setting of 72 dpi. Resolution and image size are inversely proportional to each other. Enlarge an image, the resolution decreases; reduce an image, the resolution increases. Example: a 2 x 2″ image at 300 dpi (acceptable) enlarged to 4 x 4″ has a new resolution of 150 dpi (unacceptable). The settings used during the original “capture” of an image (ie: scanning) determine its base resolution, therefore, it is crucial to scan your photos at the right resolution. Before you scan, you need to know what size your image will be in your final print. If in doubt, overestimate the size you will need. If you need to restore or retouch a damaged photo, double the scan resolution. If the original image is larger than the size it will be in your print, simply scan at 300 dpi or 400 dpi if image includes text. If the original image is smaller than the size it will be in your file, you need to calculate the resolution at which you must scan. Increase the scanning resolution by the same percentage you will be enlarging the original image. For example: if the original is 4×6, you can scan at 300dpi if you want to print at 4×6, 600dpi if you want a print of 8×10. Increase the scanning resolution (300 dpi if image doesn’t have text; 400 dpi if it includes text) by the same percentage you will be enlarging the original image. 2. Save your scanned images as lossless formats such as TIF or EPS files to best preserve color and sharpness. File formats JPEG are lossy compression for web pages, as they compress color and pixel resolution to enhance transmission speed. 3. Most scanners save images in the RGB color space. To print on a four-color printing press, all RGB images need to be converted to CMYK.